2.5 Watt 532nm Laser for 400 dollars, what do you think? No wonder it took so long to develop lasers, the magic disappears as soon as you try to look at it without having everything just perfect. Haha yes, looks like Ionlaser filled in the gaps! As he said, you need *all* of the mirrors to get lasing action at 1064nm. For the sake of simplifying if you're having a hard time understanding how this system functions you can ignore HR2 and HR3 and treat the whole thing as an L-Fold resonator like the one on the diagram below. The OC takes the place of HR2 and you ignore HR3 completely. The OC is HR@1064 and AR/HT@532 (HT = High Transmission) so without the OC all of your 1064nm light "spills out" of the end meaning you never achieve population inversion and the 1064nm line never lases. Same as when you stick the sensor for your LPM inside the cavity, but the 1064nm is absorbed instead of "spilling out" of the cavity in that case. Some reading up on resonator design and function in academic papers or on the Laser FAQ may be a great help in aiding your understanding of how this all works. If you'd like a better explanation I'll see if I can come up with something! I'm googling Die4Chill, finding some information, even the makers web site but he doesn't seem to list them there anymore. Ebay seller Tomorrowssystems sells a 40 dollar (shipping from Poland 9 USD more to Alaska) 8 amp TEC controller you can option for either heat or cold I'm looking at. Actually, you should be able to use a cheap PWM temperature controller with a FET to drive the TEC. I imagine you will be able to find a schematic online for one easily. I did have a schematic a few years back but its long gone now. You should be able to build something with reasonable accuracy too. Or get one of those all in one temperature controllers with the LCD display! Those look nice! I remember when 532 was like $1/mW. I'm adding to some old posts because I want to work with this Half-Note laser in the future to modify it for pulsed 1064nm output. I have no idea what the OC mirror should be used to allow the little YAG to lase and let 1064nm out, but adding an EOM so the unit can produce short high power pulses. Anyone know what OC mirror I should use in respect to percentage of reflectivity? 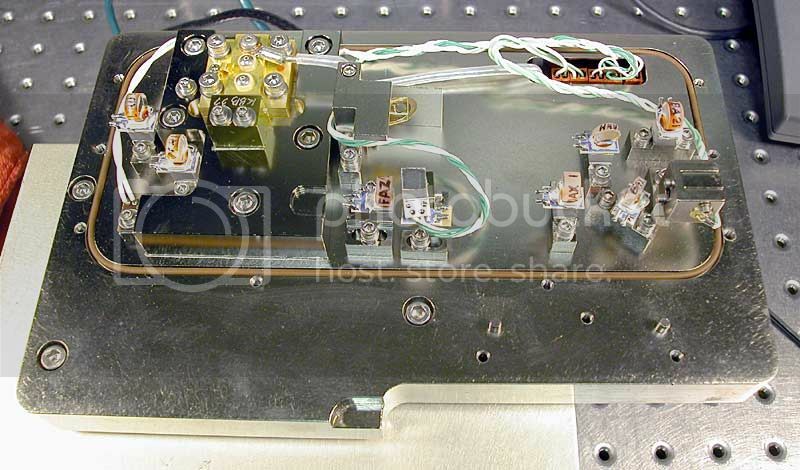 I want to create a high peak power pulsed KDP SHG 532nm, perhaps 355nm THG laser using this unit as extra-cavity instead of the Z-fold intra-cavity configuration. 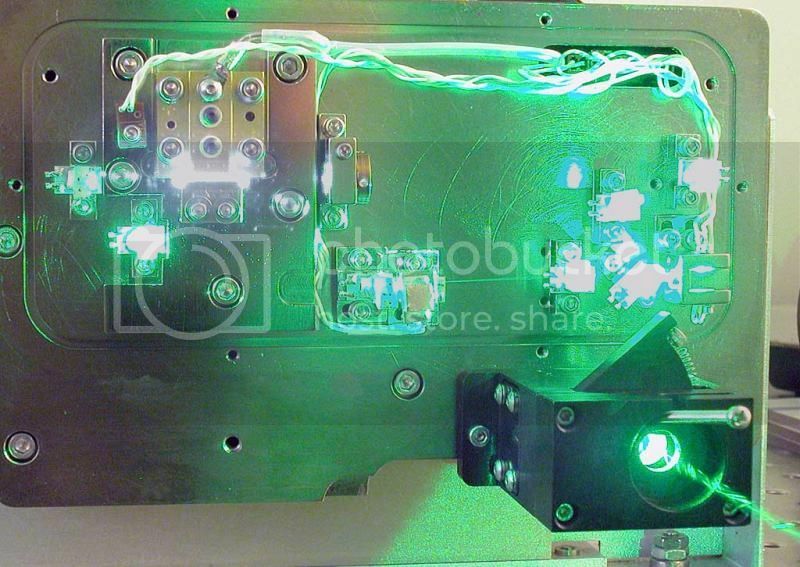 The LWE-246 is a diode pumped green (532 nm) laser utilizing a laser head called the "Halfnote", apparently developed for the Alcon OPHTHALAS™ 532 EYELITE ophthalmic laser. Is utilized a side-pumped Nd:YAG rod in a rather overly complex and long (optics-wise) resonator. 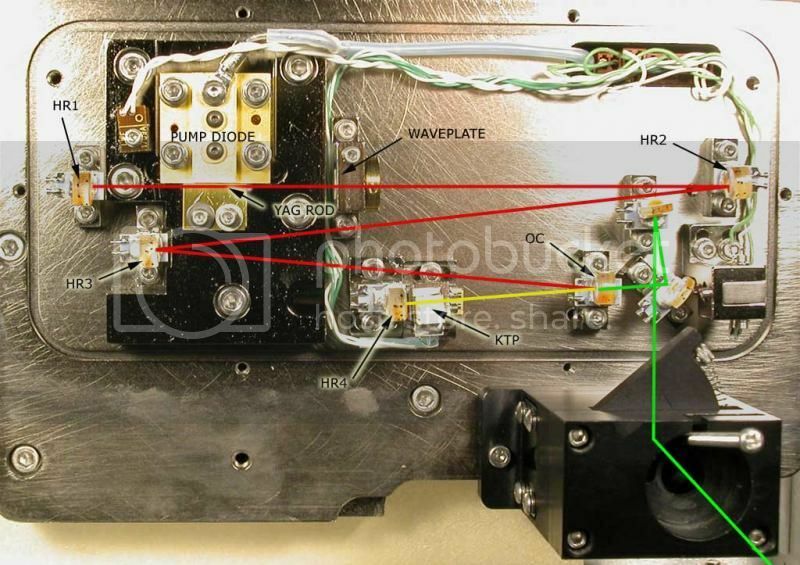 Information and photos of this laser engine can be found at LaserPointerForums Thread on Lightware Electronics Halfnote Laser. It is speculated that LWE had an excess of these lasers available after the Alcon contract terminated and the LWE-246 was the result. 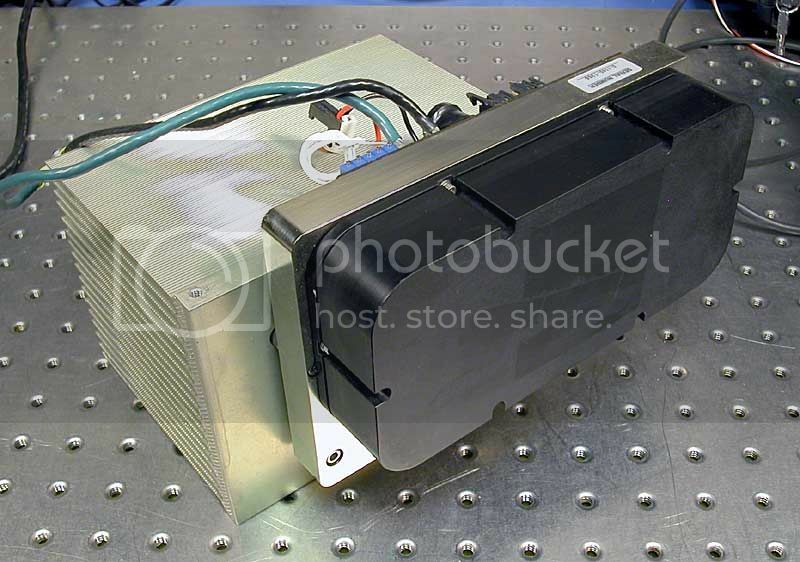 The label on the heat-sink says "Alcon" and there is no label on the laser head itself. This unit has serial number 0101 and I'll bet you any number of flying pigs that they didn't produce 101 of these. ;-) So, it may be a prototype. At the present time, there is no evidence that any others were ever built. And, there are no laser safety stickers anywhere to be found! So the LWE-246 couldn't have been a legitimate product. This unit is a bit weak if it was supposed to be rated 2.5 watts. And the 1.8 W shown on the meter was only achieved after realigning the KTP doubler and HR mirror behind it, possibly masking an alignment problem elsewhere. But so be it. There were two RMA stickers inside (which have subsequently fallen off) indicating that it might not have been exactly healthy, but it is not known whether any repairs were done. In any case, to do a full alignment of the laser resonator consisting of five mirrors and the KTP is not going to happen. By the way, I have four of these units, plenty to work with. Sam's guess that there was only one prototype made was clearly incorrect. He is right about the units output power being over rated, I have heard from others they were never able to get more than 1.75 watts out of theirs either. I have reposted photo's from page 1 here so no one has to hop back and forth between pages to see them. Does somebody know if it is possible to find those lightwave laser engane-se? Does somebody know if it is possible to find those lightwave laser engenhes? Do you know where I can find those lasers enginees? Thank you very much. This is a two year old thread and I know for a fact Alaskan is no longer active here. Please don't necro-post your questions to these old threads. It is irritating to those of us who come here only to find someone who just signed up is bringing this back to life. Yep, I saw this thread and I thought Alaskan was back. Please don’t necropost.